ST DAVID’S HALL is winding the clocks back to the Swinging 60s for one night only with some of the biggest stars from an unforgettable era! The Sensational 60s Experience returns to the National Concert Hall of Wales on Wednesday 7 March with and brand new production for 2018 and its best line-up yet featuring three UK chart-topping acts and two other classic bands. Topping the bill is Mike Pender, the iconic frontman of Merseybeat favourites The Searchers, who is still belting out the hits having first reached No.1 way back in 1963! The band burst onto the scene that year with their chart-topping single Sweets for My Sweet, and they achieved the feat twice more over the next year with the classics Needles & Pins and Don’t Throw Your Love Away. Also featured is the wonderfully soulful voice of Chris Farlowe, who is most fondly remembered for the No.1 single Out of Time, and Handbags & Gladrags. Chris famously fronted the 60s groups Colosseum and The Thunderbirds, and has worked with the very best names in the business including Mick Jagger, Keith Richards, Jimmy Page and Van Morrison! The No.1 singles don’t stop there either as hometown heroes The New Amen Corner return to Cardiff. Melding a Mod and psychedelic pop sound, the original line-up were one of the most exciting bands of the 60s and reached the top of the charts with (If Paradise Is) Half as Nice. Sharing the stage with this terrific trio is much-loved Manchester group Herman’s Hermits who are fondly remembered for their worldwide hit I’m into Something Good. Completing the line-up is Brummie beat rockers The Fortunes, who garnered international acclaim in 1965 when You’ve Got Your Troubles surged into the Top 10 either side of the Atlantic. 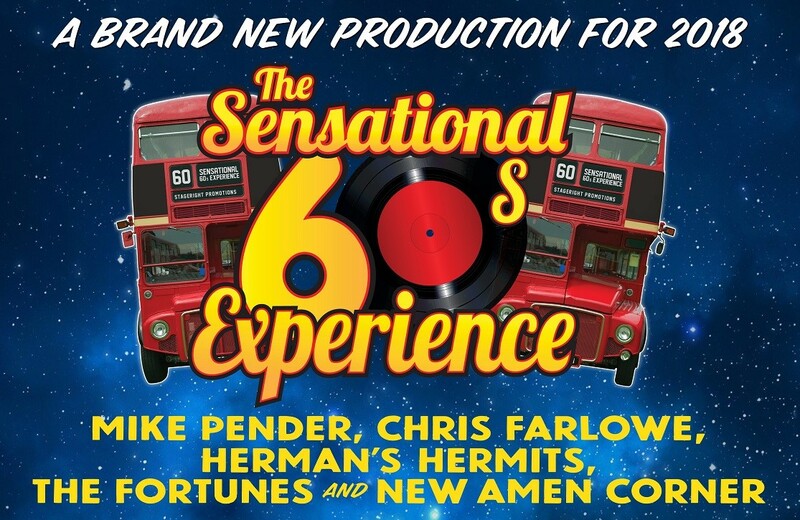 Step back in time to the greatest decade in music with The Sensational 60s Experience at St David’s Hall! Tickets are £29.50 (plus an optional £1 postage fee).